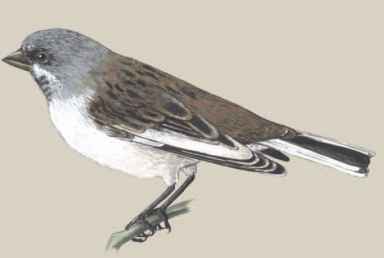 Physical characteristics: Snow finches are large, plumpish finch-like birds with a blue-gray head, brownish body, and white colorings that are visible while flying (on wings nearest the body and on tail except for dark brown bar that goes down the middle and dark brown spots across the ends). Males and females look similar, with females being paler and less white on the wings. Adults are 6.7 to 6.9 inches (17.0 to 17.5 centimeters) long and weigh between 28 and 54 centimeters). Geographic range: They are found only on mountains over 6,600 feet (2,000 meters) in Europe and Asia. Habitat: They are found in areas of barren, rocky ground and mountains at elevations from 6,600 to 11,500 feet (2,000 to 3,500 meters). They are sometimes found near buildings that are located within these mountainous areas. blown onto high snowfields. They also eat on scraps tossed out from human settlements. Young are fed only animal food. Behavior and reproduction: Snow finches are very social birds, often forming wandering groups and large flocks outside the breeding season. They spend most of their time on the ground hopping around with their wings folded. During the breeding season, they form loose colonies of up to six pairs. They build nests in rock crevices or holes in buildings. Nests are often built where trees are no longer found. They fill the crevice or hole with grasses and moss and line it with feathers. Females lay three to four eggs. The incubation period is thirteen to fourteen days, and the fledgling period is twenty to twenty-one days. Two clutches are possible each year. 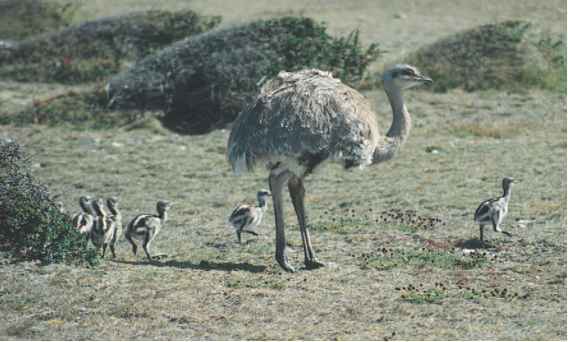 Both parents help to fed and take care of the young. Snow finches and people: There is no known significant relationship between people and snow finches. "House Sparrow. Passer domesticus." U.S. Geological Survey, Department of the Interior. http://www.mbr-pwrc.usgs.gov/id/framlst/i6882id. html (accessed on July 20, 2004). Starlings and mynas (MYE-nahz), also called sturnids, are stocky, small- to medium-sized birds with strong, straight bills (either thin and pointed or somewhat blunt, depending on the species), short wings that are rounded (in forest and resident species) and somewhat longer (in open country and migrant species), a short squared-off tail, and strong legs. Many species have plumage (feathers) that is black or dark, while others are white or other colors, and still others are iridescent (brilliant colors). Many species have colorful bare facial skin or wattles (skin that hangs from throat). They often have long, narrow feathers on the neck, with those of the males being most noticeable. Mynas have a dark brown body, black head and tail, bright yellow bill and legs, and often display white wing patches on the primary feathers. Starlings are mainly glossy green and purple with large buffy-white spots at the tips of feathers. Bills are dark brown in winter, but turn yellow in spring. Starlings molt (lose, then re-grow, feathers) once a year, following breeding, but seasonal differences are found in some species. Adult starlings and mynas are 7 to 17 inches (18 to 43 centimeters) long and weigh between 1.0 and 3.8 ounces (30 and 105 grams). Starlings and mynas range through Africa (except for northern regions), Eurasia (except for northern areas), the South Pacific, and southeastern Australia. The birds have been introduced onto all continents except for South America and Antarctica, and on many oceanic islands.